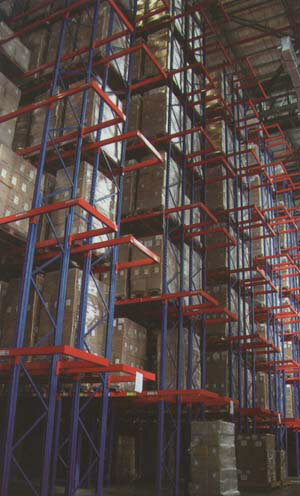 In a Very Narrow Aisle surounding, Pallet Racks are poseitioned mush closer together than in other system. This system, designed around the Operating Specifications of the handling equipment; gives an optimum use of floor area and roof height by providing High-Density Storage while still allowing individual access to all Pallets. Pallets are 100% Selective and can be accessed with apecial VNA trucks which is guided by rails or wire induction system built into the floor. Latest trend in Handling equipment is the use of ARTICULATED FORKLIFT, which can lift palletd up to 12m with savings of more than 3 times the use of Guided Trucks.